I am often approached for advice on products for eczema. Back in 2012, I wrote a post and provided a list of natural eczema creams/balms that I knew about and/or used (click here). Obviously, as time has gone by I am aware of more brands which could help people so I thought I would share those here. I've only tried two of these and the rest are on my To Try list. Allergenics Steroid Free Emollient Cream - some how I managed to miss this from my original blog post. Allergenics have a range of products but I have personally used the cream and have had good results. 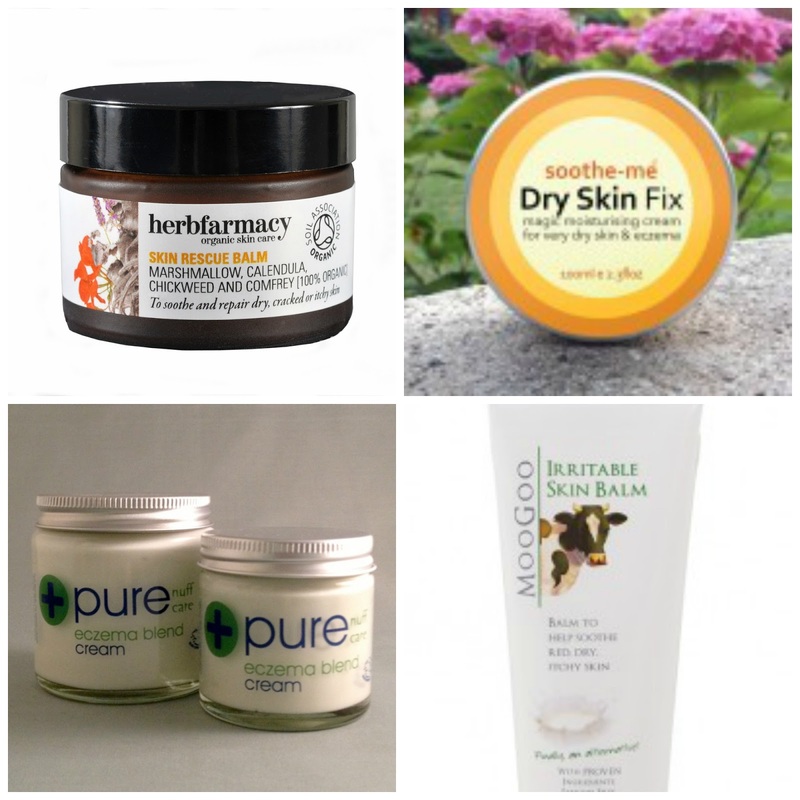 Herbfarmacy Skin Rescue Balm - this won Silver in the Problem Skin Category for the Free From Skincare Awards 2013. It is a blend of herbs and essential oils, full ingredients are available on the website. Gem’s Dry Skin Cream - a new discovery for me and they entered the Free From Skincare Awards 2014. This is described as an ointment made with cocoa butter, beeswax, sweet almond oil and a blend of essential oils. Hope’s Relief - was developed by Melbourne Naturopath Jacqueline Hope. It's ingredients were too strong for me but I've seen many rave reviews for the cream. Back to Nature Healing First Aid Balm - you may remember I interviewed Amanda (click here) and she told me her Mum uses the first aid balm on her eczema and finds it very effective. Shaloah Skincare Calendula & Borage Soothe & Repair Cream - a new discovery, I don't know much about this company but their cream popped up in a Google search and it's been on my list ever since. Moo Goo Skincare Irritable Skin Balm - a company I know from my love of Australia and their entire range is always highly recommended. Please note there a nut free cream available but be aware other products in the range contain milk proteins, all ingredients are listed on website. I hope anyone with eczema/dry skin finds this helpful. Have you tried any creams from this list? thanks for sharing these. i do have eczema prone skin, and even though my skin has been behaving, it's always great to find new products to try in case i need them. haven't tried any on this list.